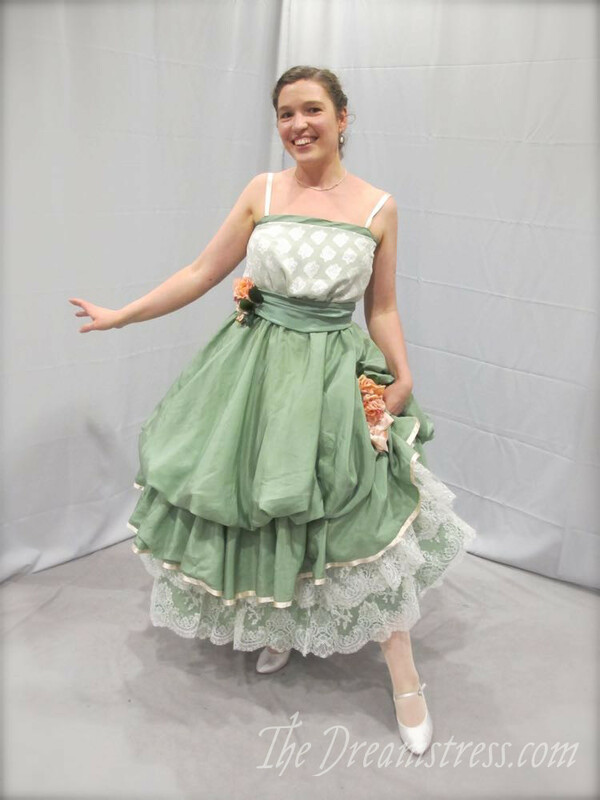 Officially, it’s been dubbed the ‘Gather ye Rosebuds’ dress – I felt I needed to make it before I was too old to get away with this look, it’s trimmed with roses, and there was lots of gathering (my gosh was there so much gathering. I gathered, and gathered, and gathered some more….). I have mixed feelings about the Jellyfish. I really enjoyed wearing it. It was very bouncy, and I bounced a lot (lots of people took videos of me bouncing and spinning in it, but so far I’ve only seen one and I can’t figure out how to download it!). And I knew it was far from perfect so I didn’t feel the need to be precious about it. But…I know it’s far (so far…) from perfect. It started out really thought-out and precise and beautifully finished, and the further out in the layers you get towards the final outer layer, the less perfect things get. I budgeted exactly enough time to sew it properly, but nothing for contingencies, and there were so many contingencies (including a hurricane). So when I look at it, all I see are the imperfections and the things I know I didn’t get right, and that bugs me. I was so rushed and frantic on the night, and prioritising helping the room get dressed and to the Gala, that I didn’t even give it a final steam (and the fabric crumples as soon as you look at it – and photos multiply any crumple by 27X), or re-do my hair from my daytime hairdo, or re-apply lipstick before I took pictures. Crumples are one thing, but not loving the construction is another. 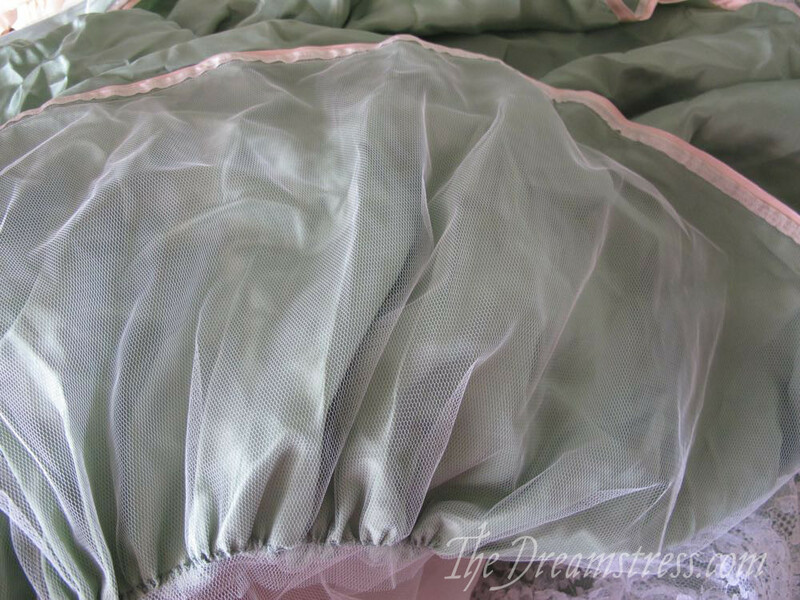 In an ideal world I would make the under-skirt (with lace) 30″ less full, re-do the gathers and re-attach the underskirt, fix the part where the overskirt is ‘growing’ (as circle cut skirts are apt to do) and arguing with its flat-lining, and re-do its gathers and re-attach it. And I’d re-do the under-bodice, as I’m not happy with where it’s top line sits, and re-do the overbodice to have a much more shaped (and consequently, much trickier to sew) top line. And replace the roses with hand-made fabric roses, and add another cluster in back, and trim the straps with roses and pearls. And add those falling-sleeve puffs. In other words, pretty much entirely re-make the dress! So now I’m not sure what to do. I could do the simplest fixes possible, get the dress to where it’s OK as a not-perfect costume, and call it good, or I could make it the way I really want it, but that would essentially involve taking it entirely apart and completely re-doing it. So, now that I’ve told you everything wrong with it, here are some things that I love about the outfit, and that make me really happy! 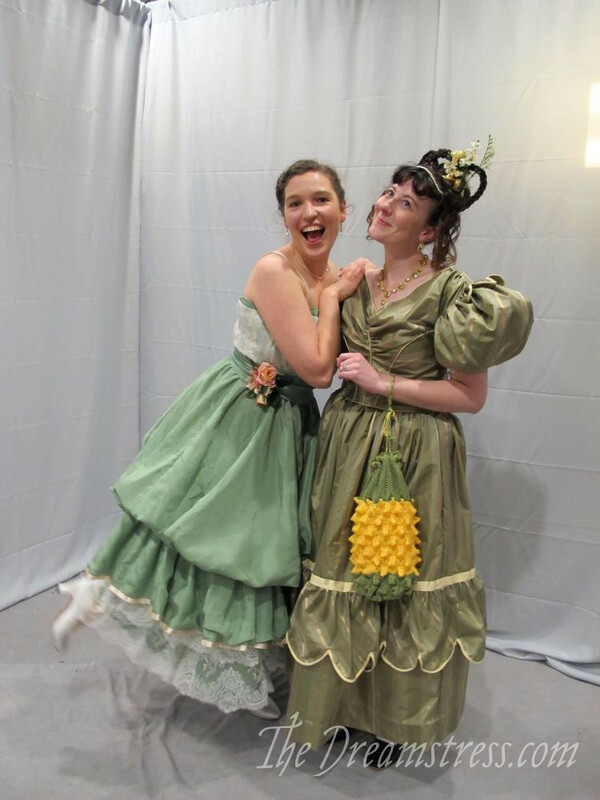 I brought all the materials to make fabric roses, but it was clear I wouldn’t have enough time, so the fabulous Meg of Nutmeg Sews went on a room-costume-rescue mission to the Costume College Marketplace with an early-bird pass. She sent me photos of flower options from the marketplace as she shopped, and they had these, and I do love them! (if they get taken off this dress they are going on a 1910s hat). #2: The bodice fabric. I bought that fabric almost 10 years ago, and have been hoarding it ever since, too scared to use it. 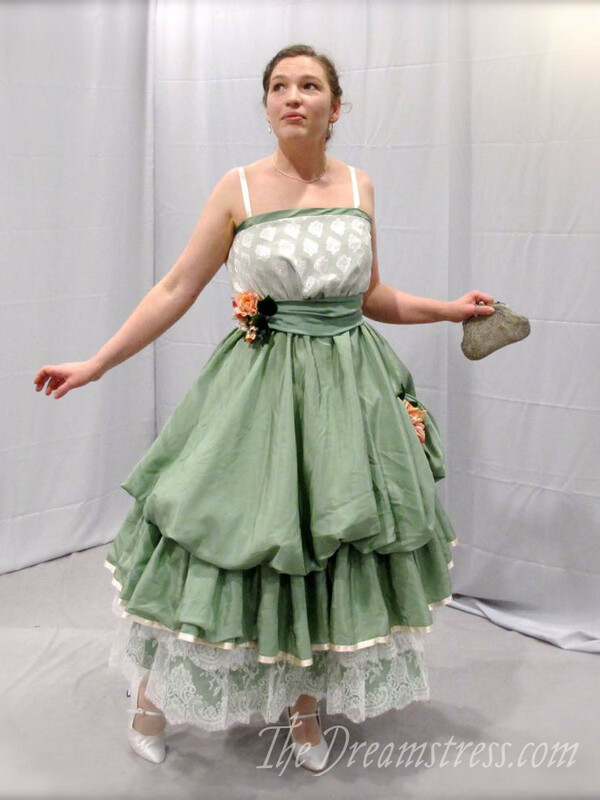 The fashion plate for this outfit describes it as being green, with a silver bodice, which sounds like a tricky match, especially with the lace underskirt, but yet when I put these fabrics together they all worked perfectly. Yay! My shoes are ballroom dancing shoes, which are pretty much as close as you can get to 1910s evening slippers both in look and construction. My stockings are made using my Rosalie stocking pattern, using silk mesh from The Fabric Warehouse. #4: My handbag. It’s a mid-century beaded number, but the lovely thing about 1910s handbags is that they all look like mid-century bags, so are easy to fake! #5: The lace. 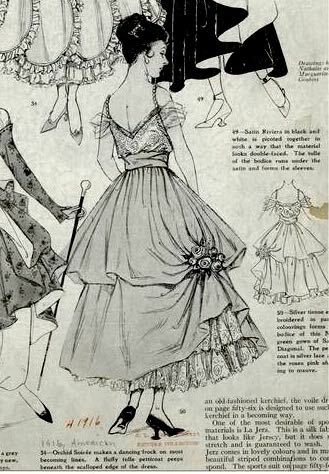 It’s 1950s, but it’s very pretty, and the motifs are distinct enough to have impact even gathered in layers under the overskirt. But wait, there is more! This dress happens to fulfil the Historical Sew Monthly August: Ridiculous challenge (I’d intended to use it for June, but realised August would be more helpful, so have moved it over), and, since I’ve been working on fixing some of the things that were a bit ad-hoc to get it fully finished right up until this week, since it’s made from two fabrics (the silver and the lace) I’ve been carefully hoarding, and since I haven’t shared any pictures of it until today, the Sew Weekly ‘Living Dangerously’ challenge. What the item is: a 1916 evening gown inspired by a Harpers Bazaar fashion plate. Pattern: Based on 1910s magazines, sewing books and patterns in my collection. 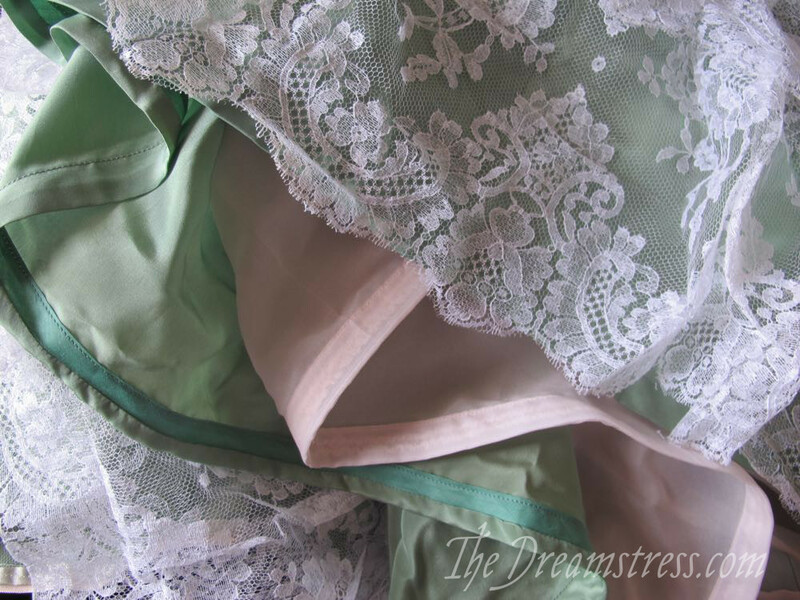 Notions: silk thread, cotton thread, SO MANY hooks and eyes and snap fasteners, satin ribbon, rayon seam binding. 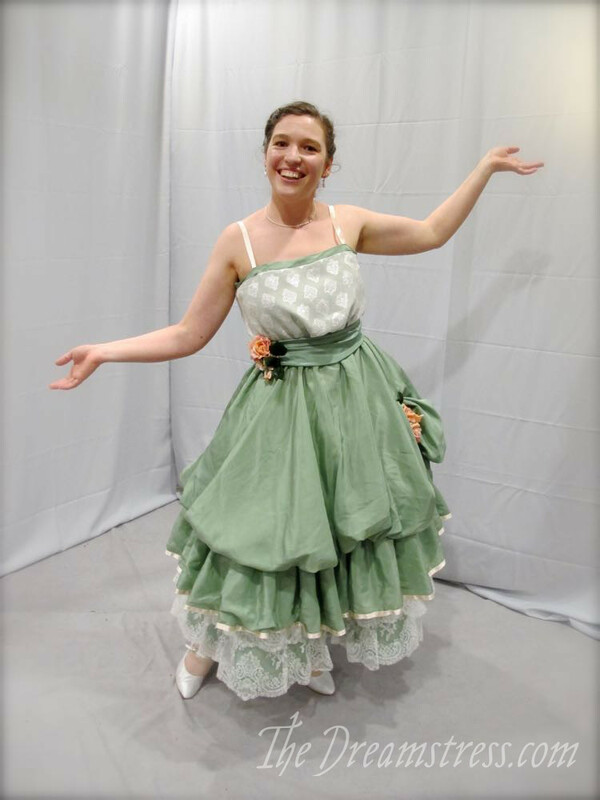 First worn: Costume College Gala, Sat 29 July – not quite finished, but at least there was only one pin in it! (a straight one, to hold down a leaf that didn’t sit properly on the sash). I’d go halfway with the remake. The skirt is basically okay, but it would be much nicer if the bodice was closer to the original. It definitely needs the falling sleeve puffs. I adore it. It’s so much more fun than I imagined it from the inspiration drawing. I am sad that you didn’t include a picture from the back! Thank you! <3 Silly me only got one back photo and it wasn't a good one. Once I get this sorted as I want it I'll do a full photoshoot! It’s brilliant and I love the green. The roses are perfect, too. It looks marvelous on you! I think the skirt came out perfect (judging from your photos). The shape and bounciness of it are wonderful! And the pink roses are just right, too. For some reason, I got the impression that the bodice was going to be pink (there may have been some pink fabric in the fabric photos you posted when you posted about making the gown). However, the metallic brocade works, and I bet I’d like it even more if I could tell it was metallic from the photo (but, given that I’m seeing the photo over the Internet, that would take a miracle.) Thanks for posting the photos! Thank you! I’m pretty happy with the skirt shape, I just want it to be a tiny bit fuller, and a tiny bit less fold-y in the hem of the lace layer. I love the dress even though it isn’t what you wanted. Perhaps adding the falling sleeve puff would help bring it together a bit more? It seems like the top half needs to match the bottom a bit more to pull it all together. I hope you rework it since I think it is so beautiful and is worth finishing to your liking! I think you look adorable in it, and it looks lovely! I’d wear it every month! My grandmother swanned around in things like this! Oh, I love you! So many period things do crinkle, but so many people are weirded out by things not being perfectly pressed. I think Hollywood has ruined us! Beautiful! You look lovely, and I’m glad you enjoyed wearing the dress – that definitely makes it a success. If you decide to alter it, you could add the falling-sleeve puffs and fix the ‘growing’ overskirt, and leave it at that. Alternatively, you could remake altogether and then have class example of what I did and what I would have done if the stars were aligned or some sort of title. But because lookers didn’t know what you would have done, it looks wonderful to me! It’s lovely l agree with Nina… l love the color and style it’s beautiful.. Thank you! I think you two have convinced me to do it the way I want it! Thank you! I will try to keep things updated as I work on it, and finish the posts I never got around to with the initial construction! God speed with the improvements! Ignore the anti-crease comments! After all, in soooo many of the painting you have posted and commented on here, there are beautiful depictions of dresses that have obviously been creased and folded. As you said, Hollywood perpetuates an ideal of perfection, but Life isn’t perfect. You look lovely, stop beating yourself up about it not being perfect to YOU. Everyone who is creative & makes anything, doesn’t matter what it is always sees the flaws & things they think they could have done better or different. I’m sure everyone who saw it thought it was PERFECT and realised how many hours of work & frowns you put in. My husband made a base guitar of exotic hardwoods a while back, it’s beautiful, but it’s got to be altered slightly as he thinks it’s not right ( & of course not perfect ) Looks ok to me & others! It’s the curse of being a maker. I see it as “gathered rosebuds”, too. And…I am sorry…I also think that you should redo it. You are an artist, after all, and you deserve the space to complete a piece as you envision it, even if it does take more work. Silver and light green is one of my favorite combinations. And green and peach is always so fun and fresh. I think that the proportions of the skirt are funny. I know that the skirt is supposed to be tiered in a way, but it seems off to me. In general, though, I think you have more than a seed. 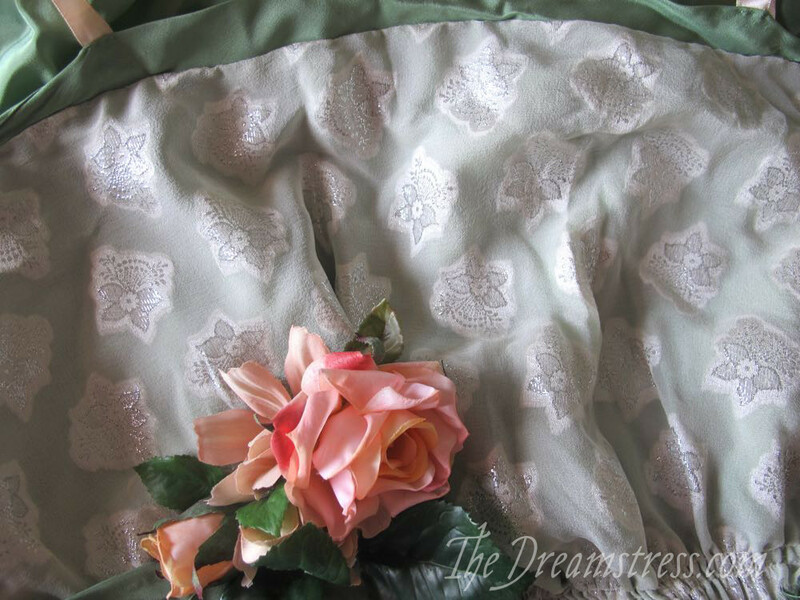 Ahem, you have a ‘rosebud’ of a dress, and it would be great to see it in full flower. Finally, seeing these photos were a balm for my soul. Reading about the neo-nazi and white supremacist violence in Virginia has made me so sad, and I was very much crying this morning reading that our president can’t bring himself to publicly decry this open racism and hatred. Where does this dress fit in? Because your dress takes the same inspiration as the alt-right, that horrid horrible KKK loving Birth of a Nation film, but takes it the opposite way as the alt-right. They are taking horrid outmoded ideas into the present by carrying torches around a church while wearing modern MAGA hats. You, however, take the beautiful old clothing parts into the present, while investing in the best progressive ideals: helping others, celebrating women of all shapes and sizes and colors, and bringing wholesome FUN to the party. I don’t have a dress that can perform quiet subversion to that film and the violence it sparked and continues to spark, but I can certainly be inspired to continue helping others and celebrating others, and having FUN! Thank you! I didn’t bring it up but I was feeling a bit guilty/weirded out by my dress. No one could help the timing. Keep on being YOU! Find the good things, keep helping others, and keep making thoughtful art. Ok, caught myself just doing a hashtag, rather than doable things, so this is a great link for a classic article on how to be an Ally to African Americans. I thought that you looked so beautiful in this dress! The colours are lovely. And it really captures the romantic feel that some designs had from the era, an interesting contrast with the other more functional wartime aesthetic. Oh, thank you! That’s so sweet! 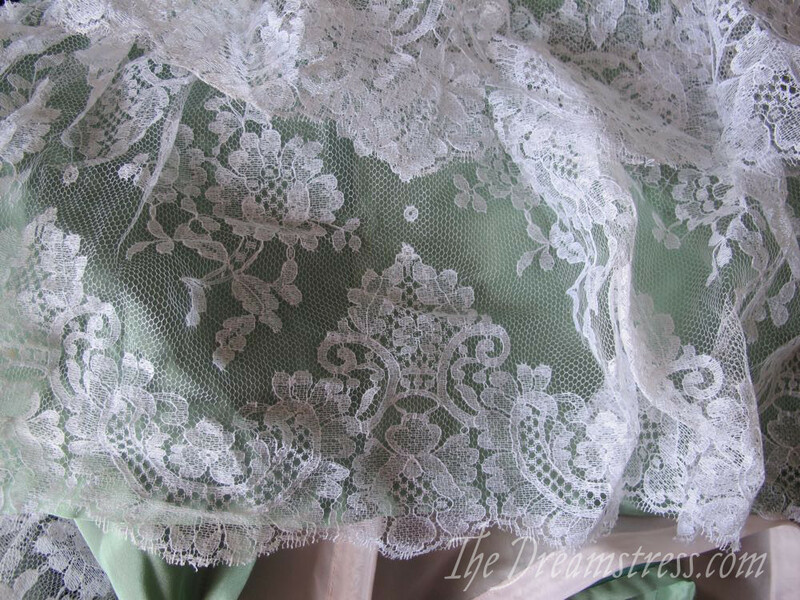 I’m sure you made a conscious choice to make the bottom green tier short (compared to your inspiration) to show off your beautiful lace. That may be throwing the proportions off a little. It will always be a beautiful dress though, whatever you do or don’t do to it! I’ve never commented before, either, but I love this dress and it looks great on you. I didn’t notice any of the flaws you point out in your article, but when I went back to look at the dress again, there they were. They still don’t bother me. I’m not any kind of clothing or costume expert, so it’s to be expected I wouldn’t notice these things on my own. Probably most other non-experts won’t notice, either. All most of us would see is a beautiful dress being worn beautifully. All the same, I agree with others. If it bothers you and all you see is things you want to change, then you should probably change them. As for crease complainers, bah humbug. People have been running late with wrinkles in their clothes for centuries. Also, I agree wholeheartedly with Elise’s comments above, and I’m so glad that so many in the historical costume community are spreading acceptance and love! Yes, it is fun to read about all the historians and creative types taking issue with the naked racism (pun intended…naked…costuming community…too much of a stretch?) we see. Was I correct in assuming that the suffragette group was an act of resistance? I hope you don’t mind me commenting but I adore your make of that dress! The fashionplate is so attractive and your dress looks an excellent rendition. I think adding the sleeves will make it all the more adorable! It’s so cool how you make from across so many periods. I really appreciate that about your sewing and your blog. You work with so many different eras and I find that really inspiring. Thank you for creating your blog. I’ll add an “I agree with everyone else” – You looked positively lovely in an awesome frock from a time period that is rather under-represented, in my opinion. Also, Nanny Norfolk hit the nail on the head with the re-work. It’s the curse of the creator to see what you would improve/change in any artistic endeavour. My brother’s first ever painting was done with cheap oils on cardboard (quality oils and canvas being beyond his teenage budget). My mum loved it, framed it and it has sat in pride of place in every living room in any house she has lived in since. For decades my brother asked her if he could ‘fix’ the issues with it that only he could see. Suffice to say, my mum didn’t let him. Unfortunately, he passed away five years ago having never realised his true vision for his creation. Re-work as you need to for you to be happy with your creation. I look forward to reading about the process! Also, wrinkles and creases? What wrinkles and creases? It looks like a dress being worn as clothes to me. rather than a costume. And it looks like you had a lot of fun in it too! I was very excited to see how this turned out, and it is lovely. I agree about the sleeves, but the one thing that I think is that the top skirt bubble is just a little too long. The proportion adjusted would look less like a jelly fish, and more like the drawing. I think it is so awesome that you tried a silhouette that is not commonly used. I really love this dress! Every photo made me smile with delight. I can see the things you are saying about it, and I know they would seriously bug me too especially in a long-planned project and fabric. But boy it made me very happy to see! I think I would probably bite the bullet and fix it if it were me, too. I would certainly complain very loudly about it, but it would almost hurt not to. It’s so delicious even in its imperfect state, it would be so satisfying remade! And FWIW I agree about crumples being authentically historical! I also agree with Elise. My first reaction after the US election was to want to throw away all my 50s inspired clothes (which is what I wear most days – not in your face vintage but certainly more vintage looking than most of my office!) but really, there’s racism and homophobia and sexism and hate in every era, including and especially our own. Wearing more modern clothes wouldn’t change that. There are other ways to make it clear that I like these clothes and the ‘nice’ parts of their meanings, and NOT the hateful parts of the era. And there are other things to do that are more meaningful and important than changing my clothing. Not to minimise the importance of how we present ourselves, and the role of historic fashion, but ignoring past eras and their fashions won’t fix the problems either. So beautiful.. real people never were unwrinkked a the time.. unless they slide their clothes on right before.